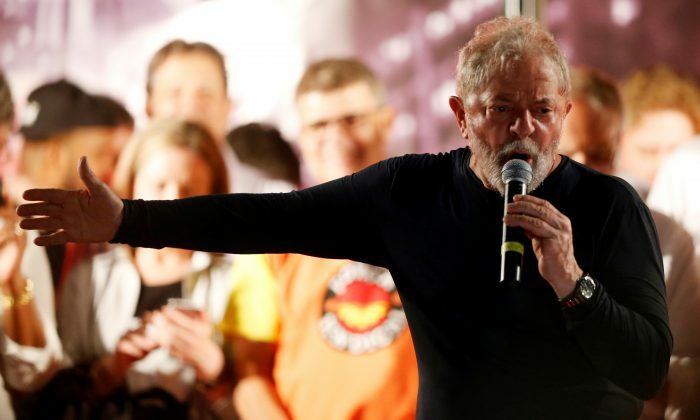 CURITIBA, Brazil—Jailed former Brazilian President Luiz Inacio Lula da Silva will step aside on Sept. 11 so his running mate can stand for the presidency in next month’s election, a top party official said, as leftist candidates’ solid showing in opinion polls dragged markets lower. The Workers Party (PT) national executive committee had decided that Fernando Haddad will be its presidential candidate in the Oct. 7 vote, said committee member and Minas Gerais state Governor Fernando Pimentel. Lula has been barred by a corruption conviction. Lula, Brazil’s first working-class president and by far its most popular politician despite facing several graft trials, had hoped the Supreme Court would agree to an appeal for more time after the top electoral court last week gave the party until Sept. 11 to decide on its candidate. But Lula has finally decided it was time to pass the baton to Haddad on the deadline set by the court and not run the risk of votes for his party’s ticket being annulled by the electoral court. Two sources with knowledge of Lula’s decision said it would be announced on Sept. 11 in the southern city of Curitiba, where Lula has been jailed since April, serving a 12-year sentence for receiving bribes. The sources asked not to be named because they were not authorized to speak publicly. A Datafolha poll conducted on Sept. 10 showed that transfer has begun. While still in the single digits, support for Haddad increased from 4 percent to 9 percent, the biggest gain among the 13 candidates running for president. The same poll also showed strengthening support for another leftist, Ciro Gomes, a former governor, and finance minister, whose support rose to 13 percent from 10 percent. Market favorites who say they will continue President Michel Temer’s economic reforms had few gains. The Datafolha survey showed far-right law-and-order candidate Jair Bolsonaro increasing by 2 percentage points to 24 percent, less than many expected after he survived a near-fatal stabbing last week. The poll Sept. 10 confirmed previous surveys showing Bolsonaro would lose to every major candidate in a probable run-off vote—with the exception of Haddad, with whom he was in a technical tie. The potential for a leftist run-off victory spooked financial markets on Sept. 11, with the real currency slumping nearly 2 percent against the U.S. dollar and the Bovespa benchmark stock index losing 2.4 percent in afternoon trading. One of the party officials said Lula’s letter anointing Haddad will be read to supporters who have camped outside the police building for five months to protest his jailing, which they consider a plot to keep him from returning to power. Lula served as president from 2003-2010. He is ineligible for office under Brazil’s “Clean Slate” law, which prohibits candidates from running if they have convictions that have been upheld on appeal.